I am a certified ADHD life coach. Are you a professional mum struggling to balance your work and home life? To top it all off, you are struggling with your ADHD child. Are you ashamed of your overwhelm and self-made crises? Have you forgotten far too many appointments to care to remember? Are your laundry are dishes piled to the sky?Do the seemingly small tasks tend to overwhelm you, and you don't know why? Are you often anxious and depressed? Are you ready to learn how to think with focus and strategically plan your home and work life so that you can finally feel satisfied and accomplished? Take heart, there is hope for you. I have ADHD myself, and I am an ADHD parent. With my life experience and my training, I get am well equipped to guide you along your ADHD success journey. Banish your overwhelm. Get rid of your shame. Find your focus and inner peace. Finally start to live the life you have always dreamed of. The Discovery Program, unique to Focus With Faigy, is the only program in the world that supports you as you move towards your dream life, whatever that means for you. I have been coaching on since 2003. I was so successful in helping clients with ADHD reach their goals that in 2015 I decided to train and get certified. 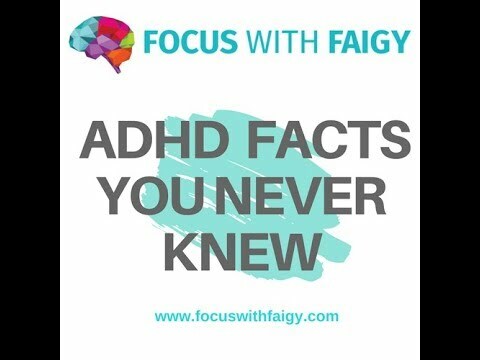 I founded the Focus with Faigy ADHD Success Centre to fill a huge void in the UK, and do my part to help those with ADHD find their inner focus and peace. I created the Focus with Faigy 5 Step Discovery Program to jump start your way to your success. This is the only program in the world that supports you as you move forward to self-understanding, and focused grounding. At Focus with Faigy I treat everybody as an individual, and fees are structured to suit your individual needs. Sessions delivered via phone or Skype/Zoom. I know that it may be difficult to focus for long sessions. I keep sessions short and to the point. No waffle. I know you have a lot going on in your life. My sessions are designed to support you. After each session you will receive a clear 'focus sheet' to consolidate your learning. All information is shared via your personal secure online folder, either google drive or dropbox, whatever you prefer; focused and organised. I know you may find it difficult to remember what we have covered during the sessions. You may want to listen to the session again. I offer an optional service, receive each session recording in a designated private folder. Choose between 30 minute or 45 minute sessions, weekly or bi-weekly. This book demystifies your ADHD. Many chapters are accompanied with diagrams and charts to help you understand the topics. The ADHD facts are backed up by study sources. This book is packed full of practical and easy-to-implement ideas that will upgrade your life to the next level. You will understand some of the primary recommended therapies that are recommended for ADHD. There is a section devoted to ideas and tools from a wide range of expert ADHD professionals. This book will show you how your ADHD challenges are actually strengths. You will understand how to channel your challenges in the right way to serve you, so that you will find the satisfaction that has been eluding you all your life. You will learn how to turn your life around using simple and easy to implement tools. Most books on organisation are great at telling you what you are doing wrong and show you a better way of getting things done. You will learn the science behind your clutter habits, as well as your beliefs that hold you back. You will understand how your brain works, you can then start to reprogram your habits and create systems that suit your lifestyle and will last a lifetime. You will learn how to banish your overwhelm forever. You will transform the way you view your clutter; you will have the helping hand that you need to get started on your decluttering journey. This compact, easy to read book is all that you need to bring your focus and inner peace into your life. "...The truth is, I've been dealing with some of the most difficult circumstances of my entire life. I would rather not share all of those, but they include separating the household from my partner, selling the house I've lived in since 2007, and moving for the first time ever on my own a couple of weeks ago. As well as decluttering/excavating over 100 sackfuls of old paperwork/decades of emotional life detritus for the charity shop/tip, so grateful to the amazing Focus with Faigy..."
"Working with Faigy has massively improved my marriage, and my work with my clients. I have learned to understand what they really need, not what I think they need." "As someone living with dyslexia I have never let this condition get in my way generally, I feel it’s aided me to be the person I am and happy being. I do believe very much in self development in all aspects from business to personal. Faigy has developed an excellent Pro program which is delivered in a warm and easy manner. Fairgy program and book contains brilliant practical skills, enabling people to become more efficient at organising themselves and would I recommend her service highly."